If you’ve been online for a while and even if you are new to this experience, you will have been exposed to scumbag marketing. There’s no getting away from it as it’s everywhere. That’s when promises are being made that cannot in reality be fulfilled. That’s when fake testimonials are being used to convince you of an outcome that is a lie. That’s when associations with ethical and prominent people are being used which don’t exist in the first place. Why are we so easily swayed to buy from scumbag marketers? Because it appeals to our immediate desires. Emotions have always prompted people to act. 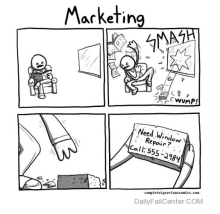 It’s a known psychological tactic that is used by any smart marketing company. We “desire” to live better. We “desire” to travel more. We “desire” to provide for our family. We “desire” to be healthier, slimmer, taller, smarter. Desires are in our nature and scumbag marketing uses that knowledge to get us to buy their “get rich if you follow this, follow me schemes”. Now I’m not saying that companies marketing their products using emotional triggers are scumbag marketers. Not at all. Emotional marketing can be used wisely and ethically. Unfortunately, the Internet is the perfect breeding ground for unethical marketing and we see it every day. How do you identify when you are being marketed to in a scumbag way? When an outcome is totally unrealistic, such as 10,000 in 10 days and any and all variations of, should have your scumbag siren going off loud and clear. When competitors are being defined as something they are not, then shown as inferior to what that marketer does. When name dropping of established brands are used without consent or affiliations to the product being sold are used. We, as consumers, need to know how to separate the wheat from the chaff. Ethical people will learn to distinguish scumbag marketers from ethical ones. And unethical people will follow and use scumbag tactics in the hopes of tricking others out of their hard earned cash in the name of greed. Unfortunately, there are some online companies that actually teach how to be scumbag marketers by using the name of a prominent and successful person to add legitimacy to their offer. I’ve heard people say that it would be an honor for your name to be used in such marketing copy. It’s not an honor to have your name used by scumbag marketers that uses the hard work and sweat and tears of someone else. If you develop a brand and develop a love for the people that have seen your value, you will not want your name on that. The problem is who is it tricking? It is tricking people that don’t know what’s going on. But eventually smart people will see through this but it will be your brand that suffers. In retrospect, I have been personally exposed to many scumbag marketers that have fooled me with their talk of transparency and caring. Fool me once but not twice. Actions talk louder than words. You CAN be an ethical and transparent and successful marketer and that’s what I teach. I don’t need to lie, cheat and fake my way to make money online since there are more people who hold the same values I do that appreciate and gladly pay for a service they know they need and can trust.